The Hyundai Santa Cruz concept pickup was shown at the 2015 Detroit auto show. Hyundai Canada says it’s considering bringing a pickup to Canada. Hyundai Motor Co. plans to launch a pickup in the United States as part of a broader plan to catch up by shifting away from sedans in one of the Korean automaker's most important markets, a senior company executive told Reuters. Michael J. O’Brien, vice president of corporate and product planning at Hyundai's U.S. unit, told Reuters that Hyundai's top management has given the green light for development of a pickup similar to a show vehicle called the Santa Cruz that U.S. Hyundai executives unveiled in 2015. A decision on the Canadian market hasn’t been made. Hyundai Motor Co., which will launch the subcompact Kona crossover in Canada and the United States this year, also plans to launch three other new or refreshed crossovers by 2020, according to people familiar with the automaker's plans. Hyundai plans to roll out a new version of its Santa Fe Sport midsize crossover next year, followed by an all-new seven-passenger crossover that will replace a current three-row Santa Fe in early 2019 in the United Sates. Plans for Canada aren’t known. 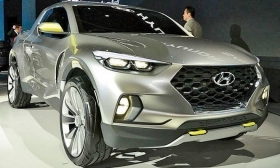 A redesigned Tucson crossover is expected in 2020, people familiar with Hyundai's plans said. Hyundai’s total Canadian sales are down 9.1 per cent this year through July 31. Its car sales are down nearly 15 per cent as Canadian consumers continue to shift to SUVs and crossovers from sedans. The automaker’s most popular cars, the Sonata and Elantra, are down 19.5 and nine per cent in Canada, respectively. Meanwhile, Hyundai's U.S. sales are down nearly 11 per cent this year through July 31, worse than the overall 2.9-percent decline in U.S. car and light-truck sales. Sales of the Sonata, once a pillar of Hyundai's U.S. franchise, have fallen 30 per cent through the first seven months of 2017. Hyundai's U.S. dealers have pushed the company to invest more aggressively in light trucks as demand for sedans such as the midsize Sonata and the smaller Elantra has waned. “We are optimistic about the future," Scott Fink, CEO of Hyundai of New Port Richey, Fla., which is Hyundai's biggest U.S. dealer, said. "But we are disappointed that we don't have the products today."